Previous PostMassive MIMO at 60 GHz vs. 2 GHz: How Many More Antennas?Next PostWhat is Spatial Channel Correlation? When Massive MIMO is restricted to per-cell processing, maximum-ratio (MR) and zero-forcing (ZF) perform sufficiently well. (Actually in a multi-cell environment the non-coherent interference tends to dominate such that ZF offers little or no improvement over MR.) Importantly, as we showed in a paper given at the same 2011 Allerton conference, and subsequently in refined form in this textbook, simple and exact formulas exist for the MR and ZF Massive MIMO performance. There is no need to use “deterministic equivalents” or other asymptotic random matrix-theoretic concepts: their mathematics is comparatively difficult, they help propagate the myth that Massive MIMO relies on asymptotics – and, most significantly, the only way of convincing the reader of their accuracy is through simulations (bringing us back to square one). Regarding multi-cell processing, I too concede that it does appear that the out-of-cell channel responses can be sufficiently well estimated for M-MMSE interference suppression to give real gains. And here, the random-matrix approximations do seem to be the only way forward. Thank you for your comment, Erik. I fully agree with you that there is no need for any complicated mathematical analysis based on large random matrix theory to study the performance of Massive MIMO under the assumption of uncorrelated fading channels. However, as soon as one deviates from this assumption, the exact analysis becomes in general intractable and one needs to resort to either Monte Carlo simulations or large system approximations. 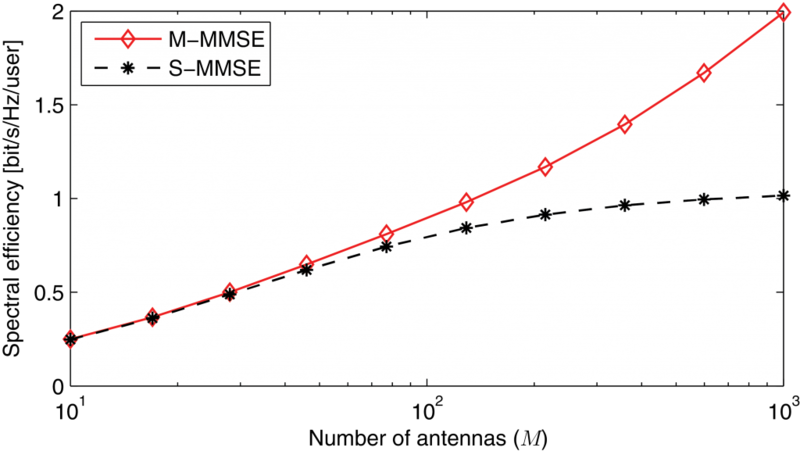 Simulations are fine if one is only interested in spectral efficiency estimates, but they fail to provide any insight. Large system approximations on the other hand often provide some insight about the most relevant system parameters. What is very important though is that the asymptotic analyses of the uncorrelated and correlated fading models lead to different conclusions. The former reveals that pilot contamination ultimately limits the performance and MR combining/precoding is asymptotically optimal. The latter indicates that there is no ultimate performance limitation and that M-MMSE combining/precoding is optimal. Yes. 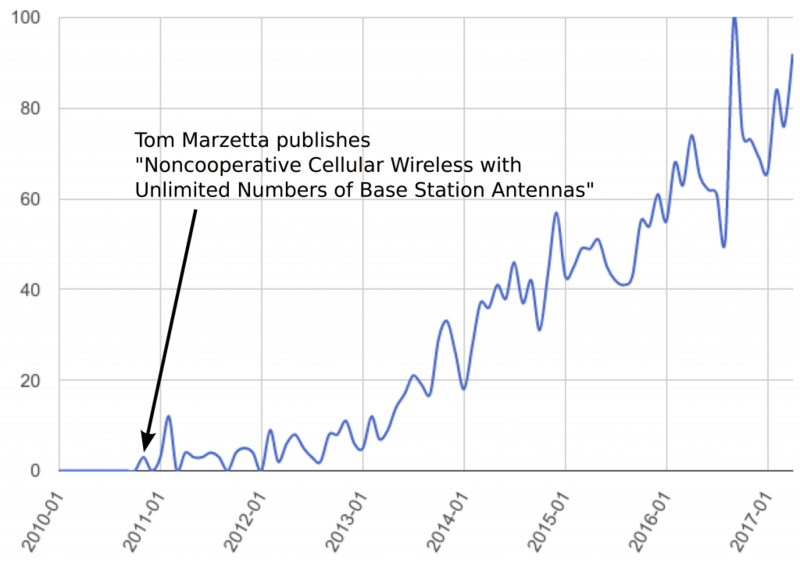 Changing the priors just slightly (and, exploiting them heavily in the Bayesian channel estimation) does seem to change the behavior in the large-number-of-antennas limit dramatically. Do we know for sure, whether pilot contamination ultimately limits performance in independent Rayleigh fading? Granted, available lower bounds on capacity suggest so, and I conjecture that it does… But are any rigorous upper bounds on capacity available? This is a good question, in particular the way it is phrased. The question is not if we can get unbounded capacity in such a scenario but rather if pilot contamination is a fundamental limiting factor. If one allows for time-sharing between cells, i.e., only users in one cell are active at any given time, pilot contamination is non-existent and one gets unbounded capacity for every user as the number of antennas goes to infinity (for any finite number of cells). This holds even for independent Rayleigh fading with MR combining/precoding. However, this is a highly inefficient scheme which one would never use in practice. Correct: with time-sharing between the cells, capacity scales as ~1/L log(1+M). So for fixed L, Massive MIMO trivially offers “unlimited capacity” when M->infinity even under the canonical independent Rayleigh fading model. This (naive) scheme is exceedingly inefficient for any practical situation and practical M, but it represents a good example of the danger (and here, uselessness) of asymptotic arguments. This fixed-L assumption is one of the reservations that I have against the conclusions in your recent paper. I do not contest the correctness of the main theorem per se, but it is obtained under the assumption that L is fixed while M->infinity. The more interesting case would be when the limits are interchanged, L->infinity before M->infinity. I conjecture that pilot contamination cannot be overcome in that case, but I do not really know, and I think it is an important open problem. (to paraphrase Hoydis’ seminal paper). Is it implied in your paper that the difference between the SINR simulations (when we know the fast-fading channel and pathloss) and SINR approximation (only pathloss known) is small and close to zero? Do you have any condition how small your difference until it is considered “small” enough? Does the deterministic equivalent hold for small number of antenna, i.e less than 50 antennas?